The Berggren treatment of the events of the autumn of 1956, surely the most dramatic of the young Organization’s history, is regrettably superficial. There is a brief reference to the Uniting for Peace Resolution, by which it is said that Hammarskjold shifted the power balance from the Security Council to the General Assembly (Berggren, p 137). This is somewhere between oversimplified and untrue. In fact, and despite a chronically stalled Security Council, this measure was only to be used 10 more times in the next four decades – the last was in 1997, and not since. Of perhaps more significance to this appraisal of this book, the Uniting for Peace resolution is not linked to the inception of peacekeeping, nor are the nearly coeval crises of Hungary and the Middle East linked at all in this book. These are not minor omissions, but are a vital part of the story of those times. The developments in the Middle East, consequent to the closing of the Suez Canal by Egypt on 26 July 1956, the Franco-British military response and the resulting disarray in the international community, are well documented elsewhere, but do need to be briefly re-told here. For our purposes, we can begin on October 30, 1956, with the veto in the Security Council, by France and Britain, of a U.S.–sponsored resolution calling upon Israel to withdraw from territories she had occupied in Egypt the day before. A Soviet amendment designed to dilute the force of the original resolution was also vetoed. The next day, the Yugoslav representative offered a resolution under the “Uniting for Peace Resolution” (also referred to as “The Acheson Plan”) to move the issue to an Emergency Special Session of the General Assembly – as this was a procedural matter, it was not subject to veto. The referral was passed over the objections of France and Britain, and the Special Session convened on November 1. Oct 22 – The first news of disturbances in Hungary reached New York. Oct 24 – The Warsaw Pact intervened at the “request” of the Hungarian Government. Oct 28 – The Sec Co agreed to consider the situation in Hungary. Oct 29 – Israel attacked Egypt. Oct 30 – France and Britain vetoed a US-sponsored Sec Co Resolution calling for an Israeli withdrawal. 0245 hrs, Sunday, 4 Nov – The Canadian Permanent Representative, Lester B. Pearson, proposed a Middle East peace force in the General Assembly. The proposal required only a two-thirds majority of those “attending and voting” (Charter, Art 18.2), and was duly passed. Nov 5: British and French paratroops dropped along the Suez Canal. The Sec Co and the GA met 15 times from 28 Oct-5 Nov: 9 times on Suez; 5 times on Hungary. The only Sec Co resolution passed was that procedural issue, whereby the Middle East situation was referred to the GA, and which did result in the formation of the first armed peacekeeping force: the United Nations Emergency Force. There were four vetoes in the Sec Co in that week. It needs little imagination to consider what a vital role the Sec Gen would have played in keeping this still-young organization from going completely off the rails, drowning in procedural challenges, displaying to a skeptical world nothing except its own ineptitude – the potential for disaster in New York was huge. Instead, Dag Hammarskjold played the art of the possible masterfully. He did what he could, and it was enough to write a first draft of that history of which those who lived it – even if indirectly – can be forever proud. And that was the Dag Hammarskjold who should be remembered. We may need now to be reminded that Berggren’s book is biography, which is not history. At least not quite – but then we come to another seminal event which does need more history than is provided here. This concerns the first peace enforcement mandate, enacted under Charter VII of the UN Charter. To address this additionally complicated phase of peace operations, we must review two vital chapters of the UN Charter. Peacekeeping missions would be deployed only with the full consent of the parties, especially of the host government (or governments). Peacekeepers would use force only as a last resort and only in self-defence, as specified in Article 51 of the Charter. The role of a peacekeeping force would be largely passive, seeking to create the time and space and atmosphere in which substantive negotiations to resolve the conflict might take place. But when, as was too often the case, that essentially positive climate of consent and cooperation was lacking, and could not be created, the UN was too often bound to impotence, and was accordingly and naturally blamed for remaining helplessly within its mandated scope of operations – this happened particularly in Bosnia and in Rwanda. Thus Chapter VII begins with “measures not involving the use of armed force” (Article 41) and, should the Security Council consider these inadequate, “it may take such action by air, sea or land forces as may be necessary to maintain or restore international peace and security” (Article 42). Actions mandated under this Chapter of the Charter are referred to as “enforcement operations”, and give to this Chapter its popular title of “the Enforcement Chapter.” A Sec Co resolution under this Chapter will frequently contain the phrase “taking all necessary measures” (it may or may not otherwise refer directly to Chapter VII). As of 1961, the UN Sec Co had never mandated a peace enforcement operation under Chapter VII, but the Congo was to change that. Nearly all that could and has been said generally and indiscriminately of all colonialism, colonialization, colonialists – it was all infamously true of the Belgian Congo, which by the end of the Fifties was unravelling with terrifying speed. The Belgians were doing nothing to prepare themselves nor the Congolese for this – in 1960 the Congolese army, the Force Publique, had not one Congolese officer. There was no Congolese civil service, there were no Congolese doctors nor lawyers and not a single Congolese engineer. No colony was ever less – or worse – prepared for independence, which was first announced by the Belgian government in November 1959, then fixed in January 1960 to take place just six months later on 30 June. Things continued to fly apart – the center was truly a heart of darkness – and on 10 July the Congolese government requested UN assistance, principally military, with the goal of developing and strengthening the national army for national defense and the preservation of law and order. On 11 July Katanga attempted to secede from the new country, and in August South Kasai asserted its own independence. l’Orientale province was soon threatening the same, thus within weeks of gaining its independence, nearly one-third of a country about the size of western Europe was, to say the least, severely unstable. Subsequently, Belgian troops re-entered the Congo without the consent of the Congolese government, and heavy fighting ensued. The Sec Co met over the night of 13/14 July, and passed Resolution 143 (1960). This called for a Belgian withdrawal, and urged the Sec Gen to take the necessary steps to provide the Congolese government with such military assistance as might be necessary. The mission Organization des Nations Unies au Congo– ONUC – was born. But things could still be worse, and they soon were. The killings of Lumumba, Mpolo and Okito on 17 January 1961 shocked the entire world. Foreign mercenary forces, originally in the Congo “at the disposal of the Congolese government”, gathered in Katanga and supported the secessionists. These were certainly at the instigation and with the direct support of the Union Miniere du Haut Katanga, a cartel with its headquarters in Brussels, and which reckoned on concessions from Katanga which might not be on offer from the government at Leopoldville. The mining company also paid the mercs, even allowing them facilities for manufacturing arms and armaments. This was well known and comprehensively documented by the UN at the time. On 21 February 1961 the UN passed UN Sec Co Resolution 161 [S/4741], urging “the immediate withdrawal and evacuation” of all foreign military and paramilitaries not under the control of the UN. The Sec Gen was personally involved in negotiations to this end, but neither the Belgian government nor the Katanga separatists took any action to achieve this. By this resolution, ONUC was also authorized to use force to prevent civil war. As mandated, ONUC forces did intervene and had some success in apprehending and removing foreign mercenary elements, but many remained at large and combative. However, in the Katanga, authorities under the leadership of Mr. Tshombe had allowed their ill-defined objectives to be entirely hijacked by groups of foreign-led gendarmes who on 13 September launched violent attacks on UN forces in Elisabethville (Katanga). Despite UN calls for a cease fire, the attacks continued, and eventually were directed by Belgian officers operating from the Belgian Consulate in Elisabethville. Air attacks by a mercenary-piloted fighter jet prevented UN reinforcements from moving in, and destroyed the UN’s small air arm. Meanwhile, Dag Hammarskjold had arrived in Leopoldville to attempt to negotiate, inter alia, a reconciliation between Leopoldville and Elisabethville, in quest for which on 17 November he flew on to Ndola in then-Northern Rhodesia, and it was that flight which crashed with no survivors. And now, peacekeeping having run aground on the mercenaries and other peace spoilers, peace enforcement was born. Those who could not or would not keep the peace would have it enforced upon them. The maintenance of law and order was the heaviest of the Force’s responsibilities, and its troop strength eventually reached nearly 20,000 – in that huge country. However, throughout 1961 repeated attacks, principally by the Armee National Congolese, and principally on UN forces, resulted in heavy casualties to the thinly-spread UN Force. In January 1961 the ANC massacred 22 European priests, in April the ANC murdered 44 Ghanian soldiers and on 11 November 13 Italian airmen died in an ANC attack. Despite assurances to the contrary, the putative authorities in Elisabethville and Leopoldville demonstrated their preference for, and their implicit belief in, a military rather than a negotiated solution, and their armed gangs tended to react with unrestrained violence towards any foreigners they might encounter – except, of course, the mercenaries and para-militaries still at large in Katanga. By fits and by starts, using force as little and as late as possible, the UN Force chivvied the Congo on its road to some sort of viable state. A government of national unity was constituted in August 1961, the Katanga secession was brought to an end in January 1963, the reorganization and reconstitution of the ANC, begun already in 1960, was largely achieved by 1963. Its assigned goals met as best as could be expected in such a negative climate, ONUC was withdrawn on 3 June 1964. The continuing governance of the Democratic Republic of the Congo, and the long-term efficacy of this first peace enforcement operation, are quite another story. But the flourish of peace enforcement operations was indeed brief: the Sec Co would not enact another such mandate for more than 30 years to come. The lessons which should have been learned: the potential for heavy casualties when peacekeepers undertake peace enforcement, and the resulting demands on force structures plus the need for robust and sustainable mandates; were simply not learned or were speedily forgotten. Put most simply, troops intending to enforce peace need to be as resolute and capable as those who seek to wreck the peace – preferably, the moreso. This simple truth the UN has never really admitted, and it is a vital lesson not learned. So when the Canadian national defense minister said in 1967, “The enforcement provisions of the Charter were tacitly abandoned”, he was pretty well right. And then in 1993 the Sec Co enacted nine resolutions under Ch VII in respect of Bosnia, Croatia and Yugoslavia. But they were talking through their collective hats. They neither said what they meant, nor meant what they said, and the whole fiasco of the UN Safe Areas in Bosnia followed as naturally as folly always follows misstatement (think Brexit, think Trump Trade Wars, think North Korean nuclear disarmament). Despite the layering and iteration of enforcement mandates by the Sec Co, there was neither the will In New York, nor the force in Bosnia, to enforce any peace, of which there was at any rate none there to be enforced – by whatever measures. The book of lessons not learned seems always to dwarf that slim volume of lessons learned – and not forgotten. Berggren’s book is well written, entertaining, and a valuable contribution to keeping alive a story which needs to be re-told at least in each “succeeding generation”; it is one that must not be forgotten, and Henrik Berggren has done us valuable service in this retelling. I can only regret that he does not give us more details of the birth of peacekeeping, nor of its relatively less successful calving of peace enforcement operations. Perhaps my “correctives” have extended the scope of Berggren’s work, but all I have written here would add barely five pages to his book. And these are at any event the really vital details of Dag Hammarskjold’s all-too brief ministry, and we must on every occasion remember more exactly what he did – and be just as precise in our recall of what he could not. And then we will know just how much we have still to do, and perhaps a few of you will do just those things – somebody certainly has to. Urquhart, Brian, Hammarskjold, Harper Colophon, Cambridge, 1972. Urqhuhart was literally present at the creation, and was an early Under-Secretary General, taking a highly active part in all peacekeeping operations, including in the Congo. His book includes a comprehensive review of the events in the Middle East in the autumn of 1956. Lipsey, Roger, Hammarskjold, A Life, The University of Michigan Press, Ann Arbor, 2013. This is an excellent blending of the personal and the historical. Authoritative and readable. roles of the Security Council and General Assembly also. It is a valuable supplement to the diplomatic side of the subject regarding which, in the case of the Congo crisis, the United States through its ambassador, Edmund A. Gullion, played a significant part alongside the UN. This history is not without practical relevance today, as the reviewer rightly notes. Thanks, Alan, for your very insightful and useful comments. Nice to hear from you! All the best to Pam from both of us. Thought provoking and well written with Jamie’s remarkable turn of phrase. I enjoyed reading this. Thanks, Grant – you are much too kind, but I am glad you liked the piece. Thank you, Jamie, for reminding us of the tumultuous start of UN peacekeeping and Dag Hammarkjöld’s role in it. 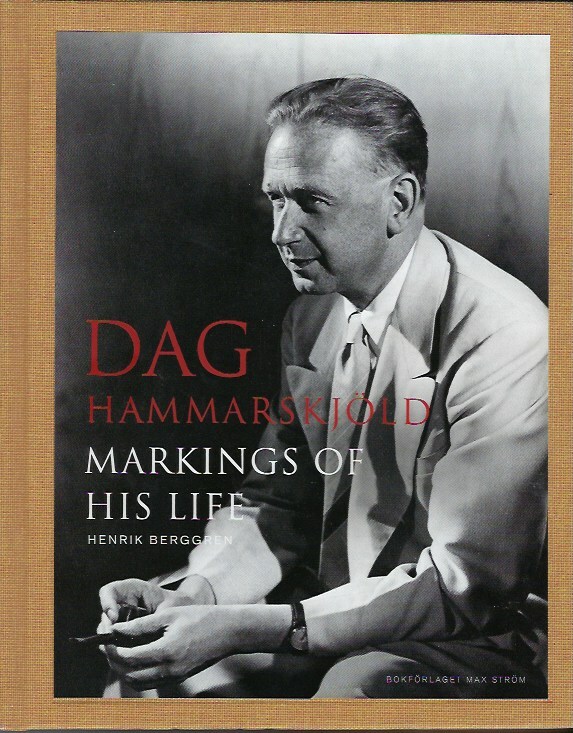 I believe that Berggren’s book meant to shed light on the person of Hammarskjöld and his roots rather than the intricacies of international politics that Hammarskjöld so well mastered. In that sense it may indeed be seen as a hagiography rather than a political biography. As I believe you said / meant earlier, there is room and need for such hagiographies too, as long as they do not fully idealise and disconnect the “saint” from his context (and his dark / gray side?). But it is also good that you got the opportunity to remind us of the often dirty history of those decolonisation days. Writing this from Belgium I feel especially sorry for what happened in the Congo, and I am still waiting for a complete answer about what/who caused Dag Hammarskjöld’s death. Thanks, Georgios, for your insightful and helpful comments. Always good to hear from you!